I watched a great episode of Rachael Ray (thank you TiVo!) 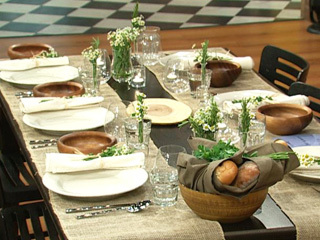 this week and wanted to quickly share a few of her "Ultimate Dinner Party" ideas. Julianne Moore was the special guest and I really admired her taste and style. It was simple, natural and basic - but so chic. I also loved Rachael's segment on the crostini bar - and was drooling afterward. Check that out HERE. Her husband's homemade cocktail didn't look so bad either...and might be on the menu at my house tonight!